In 1963, Carmel artist Alicia Meheen began the serious study of watercolor under Dorner Schueler. Having painted with artists Frank Myers, George Post, and Richard Yip, her style has emerged through regular, on-location painting and evaluation. Born in Evanston, Illinois, Meheen’s family relocated to Carmel where she graduated from high school. She studied art at the University of California, Santa Barbara. She later settled in the Gold Rush town of Murphy’s with her husband and two sons. 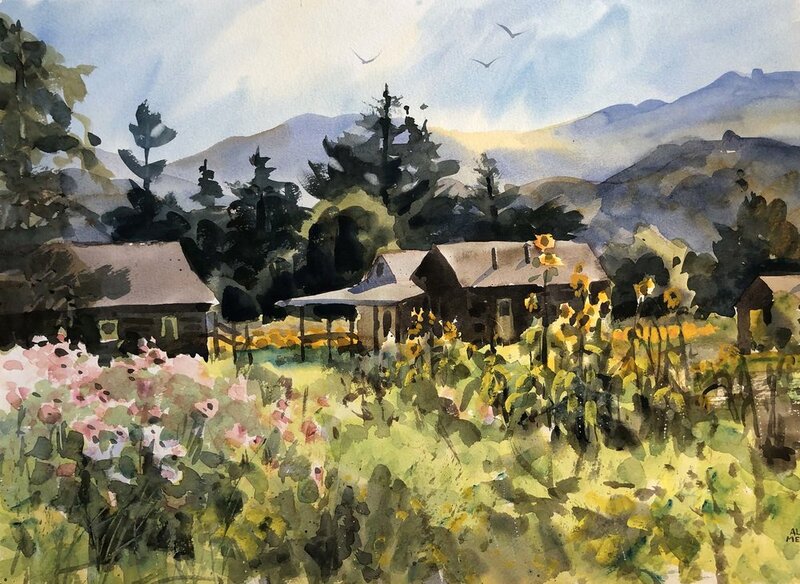 There, her paintings were exhibited in many local galleries and she served as president of the Calaveras County Art Association. In 1976, the family relocated to Esfahan, Iran, where she painted the local scene and taught watercolor painting at the Iran-American Society. The family returned to the United States in 1977 and has since made their home in Carmel. Her artwork is represented in private collections locally and abroad and have received numerous awards and honorable mentions. Most of my art is painted on location. I enjoy being outdoors. I guess the best way to describe what I do is to say it is a similar experience to walking along the beach, picking up and examining shells, stones and driftwood, feeling their shapes and textures. 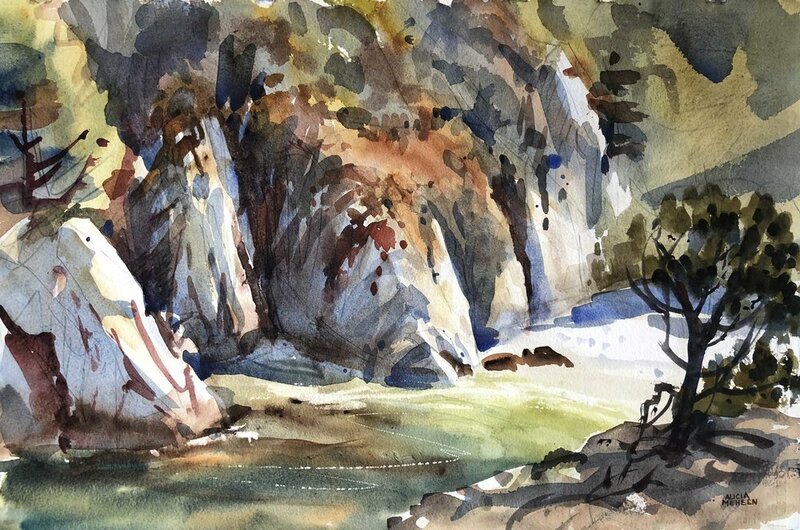 In a like manner, I explore and express my feelings for my surroundings through the medium of watercolor – it is not a complicated concept and I have a lot of fun. I am happy to feel a part of the tradition of plein air painting and hope that my viewers share my pleasure.